Located just over an hour northwest of Austin, Texas is a gem of a small state park visited by upward of 40,000 people annually. Not far from Inks Lake State Park — a great camping and swimming location — Longhorn Cavern State Park is named for the underground system it covers. Remember the alphabet soup of get-us-out-of-the-Depression New Deal programs you learned about in U.S. history? Well, we have one of these programs, the Civilian Conservation Corps (CCC), to thank for making this park and cavern so special. During the mid-1930s and early 1940s, members of the CCC cleared away the debris that clogged up Longhorn Cavern, trail blazed the area for the enjoyment of the general public, and built several buildings that remain intact today. There is some discussion among geologists about the formation of the cave, itself, but most agree that it was created by surface and underground water more than 280 million years ago. 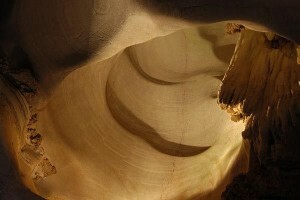 The formations are smooth and sparkling, and several of the cavern's rooms are truly vast. It is believed that the cavern has been used since prehistoric times, but the earliest recorded use is in the mid-19th century, when the cave was mined for its bat guano (some of the components of which were used to create gunpowder). During the prohibition years, it was home to an illicit speakeasy and dance hall. There are legends of its use as a meeting place for the Comanche and as a hideout for the outlaw Sam Bass. To this day, poetry readings and concerts brighten up the acoustically active space. Not all of the State Park's attractions are underground, though. The park offers a little over 1.5 miles in hiking, a few dedicated observation areas and plenty of picnic tables. As the average high in July is 98, though, I assume these only get used extensively during the milder months. It is worth climbing to the top of the CCC Museum, however, to survey the castle supposedly built by the inventor of clumping cat litter. The gift shop has plenty of souvenirs for remembering your trip, and the snack shop is a welcome sight after the cave's more physically demanding tours. A respite from the heat or chill of the outdoor weather, the cavern itself is 68 degrees year-round. While visitors cannot view the cavern on their own, there are different tour options to suit nearly anyone's interests. The daily walking tour covers a mile and a quarter in a slow hour and a half, allowing plenty of time for photos and for the knowledgeable guides to share the cave's many stories. The path's relative flatness makes the tour suitable for families and visitors of any age. 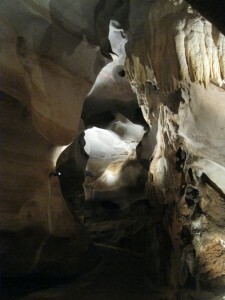 The Wild Cave Tour is closer to two hours long and is only offered on Saturdays. Armed with knee and elbow pads, helmets and head lamps, adventuresome spelunkers can try their hand at relatively elementary caving that involves squeezing through tight spaces and crawling through mud in order to reach secret places within the caverns. I love how this tour's route crosses the daily tour's path regularly so that Wild Cave Tour-goers are essentially treated to two tours in one. It is especially rewarding when Wild Cavers encounter daily tour groups, scaring the masses by creeping out of unobtrusive holes in the walls like mud-covered cave monsters. The park offers additional specialty tours, including a geology tour, a photography tour, and the ever-popular paranormal tour. Considering the cave's long history, it stands to reason it may be home to more than just a few bats and crickets, right? Whichever tour you elect to take, make sure you call ahead, because availability can be limited. A delightful, beautiful and historic site, Longhorn Cavern State Park is the perfect way to spend a camping day in the Texas Hill Country. Have you been to Longhorn Cavern? Do you have other cave experiences? What are your thoughts?